Welcome to our Blog, if you've stumbled across this blog by accident we will start with some background info about the people behind the computer screen. If you are here on purpose and follow us on Facebook or Twitter then hey, thanks for stopping by. I'll start by telling you a bit about Kirsty, which is *me* the one currently typing. I'm 29, into gadgets and all things geeky. I'm currently completing a list of things to do before I am 30, which is fast approaching. My wife of 1 year is Clara. She is 23, my polar opposite, she loves theatre, swimming and me! We met 5 years ago this year and married October 2010. We had always planned on starting a family after we got married and are very happy that this dream is coming true. We discovered Clara was pregnant in November 2011 and managed to keep it mostly a secret until January. The first few weeks haven't gone as smoothly as we hoped. Clara had a short stay in hospital two weeks ago due to bleeding, which was incredibly scary! We had been reading all kinds of horror stories online *never a good idea* which detailed how things ended badly with bleeding etc. The bleeding was more than spotting, so you can understand we were anxious. After observation and tests, including our first glimpse of our baby, Clara was given the all clear and sent packing. 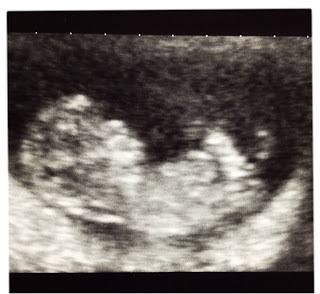 Unfortunately the bleeding continued for the rest of the week so we had to have a second scan, which is when we got the first picture of our future baby. This has really set our minds at ease. So we highly recommend going to your GP if you are worried at any point in your pregnancy. All the medical staff were lovely and reassured us this is very common. Since Clara has now stopped being sick, her appetite has come back with a vengeance. But being pregnant makes your taste buds strange and she's not hungry for just anything. Her craving is Noodles and not just any noodles but a specific brand. She has cleared the shelves in our local Tesco of Koka noodles and I even discovered last night that she had rang other Tesco's to check their stock. I am sure I will enjoy the task of hunting them down at 3am in the morning in the next few months. So all is well right now, our next scan is in two weeks and we can't wait. We have also been busy picking up lots of freebies, which we will be posting about and reviewing.